The third generation Audi TT made its debut at Geneva. There was a huge amount of new metal at this year’s Geneva Show but no real standout star. Everyone I talked to seemed very bullish about prospects for the new car market this year and there was a palpable sense of optimism in the air, which was a very pleasant change. One of the more significant launches wasn’t even of a car. Apple choose Geneva to launch their new CarPlay system. It’s essentially a very advanced link between your phone and your car and it allows the phone to take over the car’s display and be controlled by the car’s buttons or by voice. As it evolves, it will become the most natural way to interact with your phone while driving. CarPlay is an operating system that can be applied to any iPhone that can run iOS 7 or later and is equipped with a lightning interface – essentially iPhone 5 or later. Right now, the system has been launched by Ferrari, Mercedes and Volvo, although a plethora of manufacturers are waiting in the wings to introduce their own versions. Watch this space. Also in the tech area, Opel made the surprise announcement that they are bringing OnStar to Europe next year. OnStar, a plot device in many a Hollywood movie, is an interactive subscription based service, which provides assistance, navigation and other services to drivers at the touch of a button. It uses real operators at the other end of the phone to provide whatever information or assistance needed and it’s already well entrenched in the US so it will be interesting to see how things develop on this side of the water. Opel also announced a new three cylinder 1.0 litre turbo petrol engine, with an output of up to 115 bhp. A new, quieter 1.6 litre diesel is also heading this way. One of the more significant launches of an actual car was the introduction of the third generation Audi TT. It follows the same design language as its predecessors and could only be a TT. Inside though, it debuts a ‘virtual cockpit’ which uses a 12” colour display to replace the instruments. To further simplify the cockpit, the controls for the air conditioning system are mounted in the centre of the air vents – a new one on me. It’s 50 kilos lighter than the last model and comes with a range of petrol and diesel engines, with power outputs of up to 210 bhp in the case of the TTS. Another significant launch, even though it’s only a facelift, was the Ford Focus. While it’s little changed from the outside, save for the addition of the ‘Aston’ grille, the car has been thoroughly re-engineered in a bid to regain its handling crown, lost recently to the Golf. Ford have also taken the opportunity to fit an 8” colour screen and simplify the cockpit, bringing it right up to date. New 1.5 litre diesel engines also make their debut. 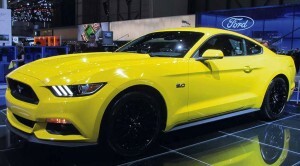 Ford’s Mustang is on the way. The first order is already in from a Donegal man. Geneva also saw the European introduction of the iconic Mustang, a car that will come to right hand drive markets for the first time. Although a proper 5.0 litre V8 is on offer, a slightly more sensible 2.3 litre four will also be on sale. Another interesting debut was the Qoros 3, seen for the first time in full production form. It’s a name you probably haven’t heard before, but it’s the first of a wave of Chinese manufacturers who want to make their mark in Europe. The Qoros is the first Chinese car I’ve seen that I’ve been impressed with. Both saloon and hatchback look well and appear to be well finished inside. The icing on the cake is a five star safety rating, unheard of so far for a Chinese car. In fact, the Qoros scored higher than any other car tested at the same time in late 2013. Jaguar didn’t have any real new metal for us to gawp at, but they did have a significant announcement. The XE will be the name given to their new small saloon, which we’ll see before the end of this year. 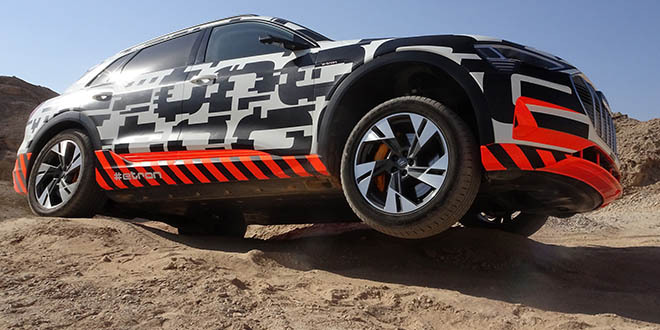 It will use the chassis of the CX-17 SUV, which was introduced at Frankfurt last year and will be powered by a range of new, ultra-efficient four cylinder diesel and petrol engines. The odds are that it will make its debut in Paris next September, neatly following on from the F-Type’s introduction two years ago at the same show. Maserati’s gorgeous Alfieri Coupé was my star of the show. 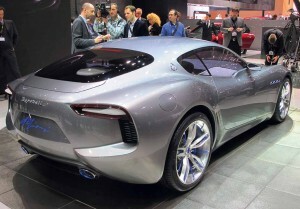 One of the best looking cars at the Geneva show was Maserati’s Alfieri Coupé. Officially, it’s a concept car, developed to celebrate the Italian firm’s centenary and named for one of the original Maserati brothers. Despite being a concept, it looked like it came straight out of the showroom and Maserati should build it as soon as possible. Power comes from a Ferrari-sourced V8. Speaking of Ferrari, they are back building turbocharged cars in the never-ending search for efficiency. The new California T uses 15% less fuel than its naturally aspirated predecessor, yet it develops 70 bhp more. BMW had quite a lot of new product, including their first front wheel drive car, the 2 series Active Tourer. Built on the same platform as the just-introduced third generation Mini, it features a spacious, well-appointed cabin and should drive well, despite BMW’s whole ethos being based on rear wheel drive. Two 4 series variants also made their debuts, the Gran Coupé and the convertible, which again is a hard top design. The Gran Coupé is undeniably handsome and appears to be quite practical, with decent room in the rear seats and a spacious and usable boot. Finally, some real competition to the Audi A5 Sportback. 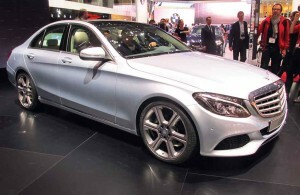 The all-new Mercedes C Class will come to Ireland before the end of the year. Arch German competitors, Mercedes Benz, were showing the production version of the S Class Coupé, a car we’ve seen in concept form before. The big launch for Mercedes though was the new and eagerly anticipated C Class, which brings more than a touch of S Class style to the mid-size saloon market. It will be here in Ireland before the end of the year. 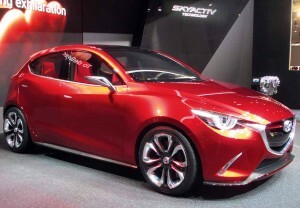 The Hazumi concept could form the basis of the next Mazda2. The Mazda Hazumi is officially a concept car, but we’ve seen before with Mazda that concept cars invariably become production cars with very few changes. This clearly is the next Mazda2 and if they don’t alter the styling, it’s going to be one of the best looking small cars on the road. It also previews a new 1.5 litre diesel engine, which will no doubt be seen in other models before too long. Hyundai showed their intriguing Intrado concept car, the first Hyundai designed entirely under the eye of new styling director, Peter Schreyer. The Intrado is an SUV designed to explore how cars will meet future customer requirements and it’s built using a central carbon fibre frame, with body panels made of ultra light steel. It’s designed in such a way that the body panels can easily be replaced by other materials. Power comes from a next generation fuel cell, offering a range of 600 km/h and no emissions except water. Also on the stand was the Genesis, a full size saloon that’s already on sale in the US. 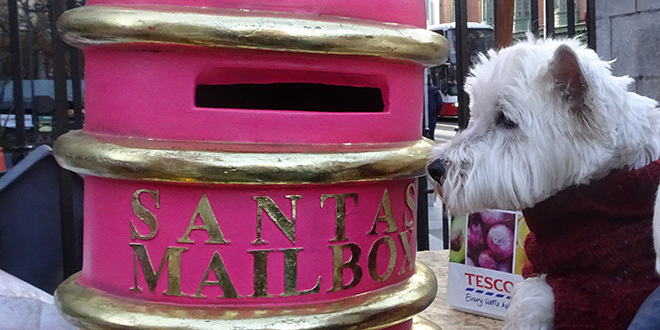 There are plans to bring it to Europe, although an Irish launch is unconfirmed. With a 3.8 litre V6, an eight speed automatic gearbox and four wheel drive, it comes as one version with very high spec. It’s a convincing luxury car. Renault’s Twingo is rear engined to release more cabin space. Geneva also emphasised small cars, the most intriguing of which was the Renault Twingo, which breaks with tradition by using a rear-mounted engine, a three cylinder unit, which comes with or without a turbo. This configuration releases a huge amount of interior space and allows a very tight turning circle, which should prove useful in urban areas. 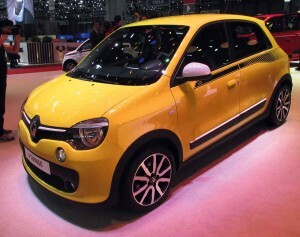 The Twingo has an endearing look about it and deserves to do well. 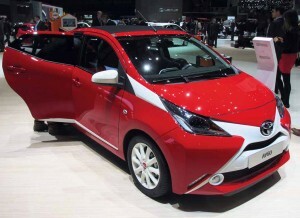 Toyota’s Aygo, sister car to the Citroen C1 and Peugeot 108, sports an intriguing two tone design. Another trio of small cars making their debuts were the Toyota Aygo, Citroen C1 and Peugeot 108. Although produced on the same production line, the three designs are far from identical and it will be interesting to see how their respective makers position them on the market. I noticed that even though they are five door designs, the rear windows don’t slide down, they just pop out to provide ventilation. Power comes from a three cylinder 4 valve engine, which produces 51 bhp from 998cc and emits just 90 g/km. 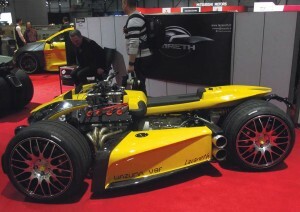 One of the crazier exhibits was this trike, powered by a Ferrari V8. Yes please. There was plenty more to be seen at Geneva but this is just a flavour of all that was there on show. 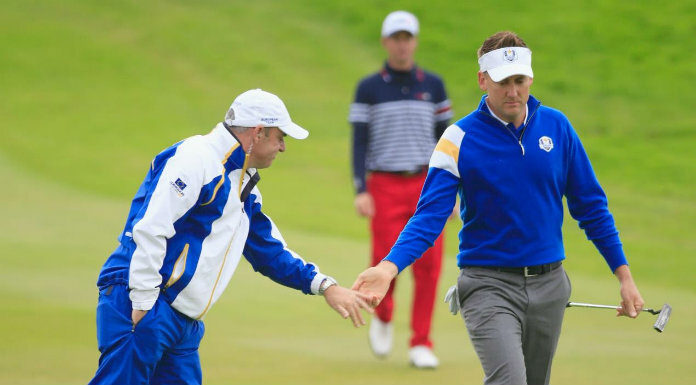 It was certainly good to see a real air of confidence, even if an overall star of the show was absent this year.